This guide opens with a screenshot of the first three frames of a storyboard below that accurately follows the codes and conventions of a professional storyboard. The PDF download will allow you to see the full storyboard. 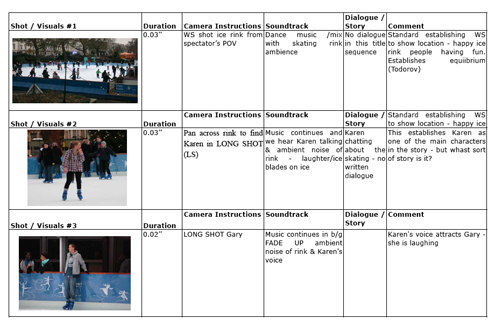 This sequence (see Skating Storyboard below) intentionally draws on the popular US TV series CSI: franchise crime dramas – storyboard is in landscape format. We created this storyboard in Excel and then saved it as a PDF. Using Excel means that creating columns and adjusting areas is much easier than in Word. However, drawing storyboards by hand or filling in a printed template is fine. What’s important is that the images used resemble the shot description and all technical language and other storyboard codes and conventions are followed.